David Rose was born in Melbourne. He began painting and printmaking in 1960, first making the screenprints for which he is best known, in 1961. In 1964-65 he travelled in Europe and studied etching at Escuela Lonja in Barcelona; he also produced a series of lithographs at a local commercial lithographers workshop. From 1967-76 he taught printmaking at East Sydney Technical College, leaving to pursue his own work full-time from 1977-86. Rose taught at the City Art Institute, Sydney from 1986-90. Since 1976 he has lived and worked in Ourimbah NSW. This drawing was exhibited in the 2003 Dobell Prize for Drawing and is the largest drawing yet undertaken by the artist on the theme of trees, in which he has been interested since the late 1970s (eg. 'Angophoras' 1981, screenprint AGNSW collection). This work was acquired by the Gallery in 2004. Signed l.l., pen and black ink "david rose". Signed l.r. with monogram, black ink "dr". Not dated. 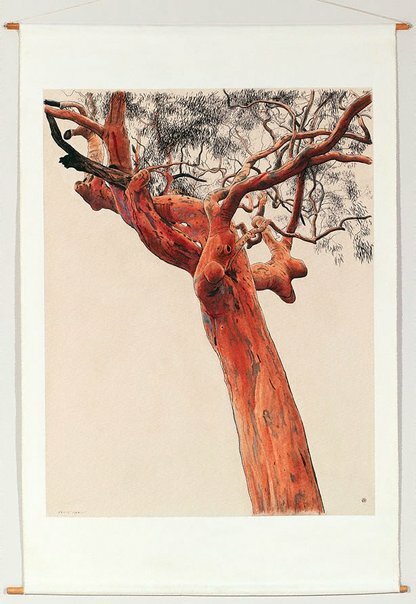 Helen Campbell, Contemporary Australian Drawing: 20 years of the Dobell Prize for Drawing , ‘Other works acquired from the Dobell Prize for Drawing’ compiled, pg. 62-72, Sydney, 2012, 10, 70 (colour illus. ), 77. Elizabeth Fortescue, The Daily Telegraph , ‘Battle lines drawn as some see the light on artwork’, pg. 11, Sydney, 13 Sep 2003, 11.